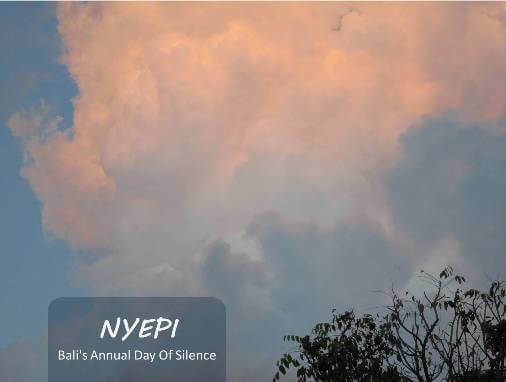 Nyepi is a day of silence and conducted annually as the turning point of the year in the Saka Calendar. This is where the Balinese focuses on self reflection, fasting and meditation. On this day almost all over the island will look like a halt. The streets will be empty, no noise from TV and Radio, No Internet, and even less activities inside Balinese houses. The traditional security men or called "Pecalang" will carry out his duty, patrol and maintain security during the celebration, in which Balinese Hindus are performing the Catur Brata Penyepian (restrictions). The restrictions or brata conducted during Nyepi have a significant impact on tourists. They can still do activities in the Hotel, but not allowed to go to the road or beach. The airport, harbors and toll road are closed during the festivities, so no visitors can enter or leave the island. The hospital remains open 24 hours. #Melasti (Mekiyis) is done 3-4 days before Nyepi. Balinese will bring sacred objects of the temple to the beach (sea), lake, or river. The ritual is performed to purify sacred objects such as statues (arca), pratima, and pralingga, and to acquire holy water from the sea (Tirta Amerta). #Pengerupukan (Tawur Agung Kesanga) is done a day before Nyepi (Nyepi Eve). This ritual is also often called "Mebuu-buu", aiming to neutralize the negative elements and create a balance with nature, mankind, and God. This ritual is performed during the sunset (Sandi Kala) at each home and the environment. Some properties used include torch (from dried coconut leaves), kulkul (slit drum), tulud, broom stick, etc. Then proceed with the ogoh-ogoh parade around the village until midnight. 1. Amati Gni: No lit a fire / light, has a meaning not to raise emotions or anger. 2. Amati Karya: No working or doing physical activity has a meaning to pause from the physical activity and focus on spirituality. 3. Amati Lelungan: No traveling has a meaning not to be tempted on something that looks outside and always introspective. 4. Amati Lelanguan: No having fun or enjoying the entertainment, meaning not to be lost on physical pleasures and expected to sharpen the spiritual to achieve higher awareness. #Ngembak Geni is held the day after Nyepi. On this day the implementation of Brata Penyepian has ended and the activity returns to normal. Balinese will do Simakrama or visit relatives. In addition, the moment after Nyepi is also used to hold the "Dharma Shanti" in a wider environment to strengthen the brotherhood. This is a unique cultural heritage and tradition of ancestors. The saka year is a calendar system of the Saka Tribe (Indian) and was officially used as the royal calendar system in 78 AD. In 456 AD (378 Saka), a holy priest of the Hindu religion named "Aji Saka" came to Indonesia. The priest arrived in Rembang (Central Java) and taught Hinduism in Java. Furthermore, this calendar system is included in the Book of Negara Kartagama in the era of Majapahit Empire. Finally, the Saka Calendar System spread to Bali and still used up until now. Nyepi itself is officially designated as one of the national holidays based on the Presidential Decree No. 3/1983, dated January 19, 1983.